After seeing August Wilson’s “Seven Guitars” at Two River Theater in Red Bank, I got in a reminiscing mood; I’d twice seen Wilson’s “Two Trains Running,” at the Peter Norton Space in New York City in 2007 and at Two River in 2013. I revisited my impressions of the 2007 production, which follow. On Jan. 26, 2007, a freezing cold night, a friend and I caught August Wilson’s “Two Trains Running,” directed by Lou Bellamy, at the Peter Norton Space on 42nd Street between 10th and 11th in Manhattan. It was a transcending experience. We had front row seats, a bit closer to stage-right than center. The Peter Norton Space is a small house with a low, wide stage, so the cliche “there’s not a bad seat in the house” applies. 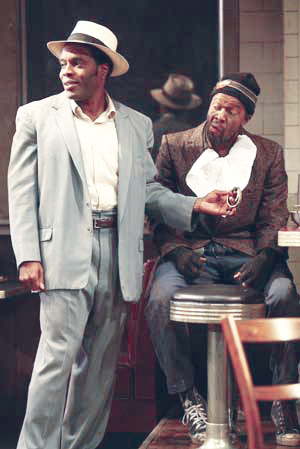 Chad L. Coleman as Sterling and Leon Addison Brown as Hambone. Not that “Two Trains Running” is a preachy piece; this is one of those plays that can have you misty-eyed one second and laughing the next. Wilson’s penchant for characterization via dialogue is remarkable. “Two Trains Running” is a long play, but I never wanted it to end. The cast is glorious. Frankie Faison plays diner owner Memphis. (Faison is remembered as Barney, the prison guard who treats Anthony Hopkins’ Hannibal Lecter with humane decency in “Silence of the Lambs,” and Burrell, the police commissioner often at the receiving end of bitter political fallout in “The Wire.”) Memphis dreams wistfully of selling his diner to the city at 500 percent profit. January LaVoy is Risa, a waitress whose profoud self-esteem issues have driven her to self-mutilation and mistrust of men. Chad L. Coleman (another “The Wire” cast member) is Sterling, a young buck recently released from prison who tries to score a job — and penetrate Risa’s invisible wall. Also in the cast are Ron Cephas Jones as Wolf, a likable numbers hustler; Arthur French as Holloway, a sage-like old-timer; Leon Addison Brown as Hambone, a mentally disabled man; and Ed Wheeler as West, an imperious funeral home proprietor. I hereafter plan to monitor the work of this cast, and urge you to do the same.